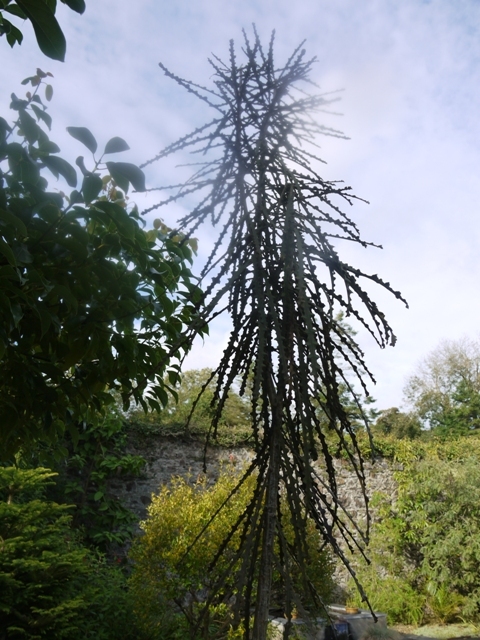 Last September I visited an intriguing garden at Treffgarne Hall, near Wolf’s Castle. Here stands a large plain two-storey country house built in 1824 and virtually unaltered by its subsequent owners. It stands on the Landsker line: the division between Norman and Welsh Pembrokeshire, on a windswept hilltop. The south facing house looks right out to distant refinery stacks at the coast at Milford Haven 16 miles away. By the 1960s its fortunes were shabby, with rotten floors and an overgrown garden. The land, the farm, the outbuildings were serially sold off, until just the house and four acres remained, an unsuccessful country hotel. This was bought in 2003 by Martin and Jackie Batty and a transformation began. The walled garden on the hilltop had been embellished by the former owners to contain a hard tennis court in the farthest third, which looks sadly decrepit today. The rest was, in 2003 a blank canvas of weeds. But when I passed through the stone garden doorway west of the house I seemed to step into a Chelsea show garden. 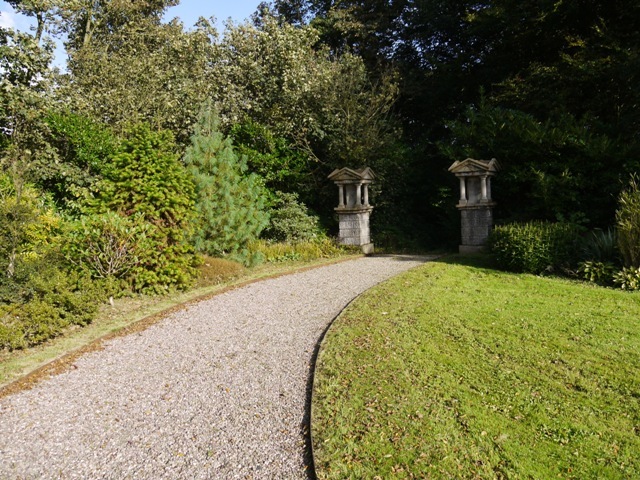 I found an immaculate formal space of slate paving, parallel rills and four symmetrically planted paulownias, flanked by huge oak pergolas trailed with Clematis armandii. The design was created with advice from the Julian and Isabel Bannerman, the designers who used to garden Hanham Court near Bristol. It feels highly improbable to step from rural Pembrokeshire into such a space. 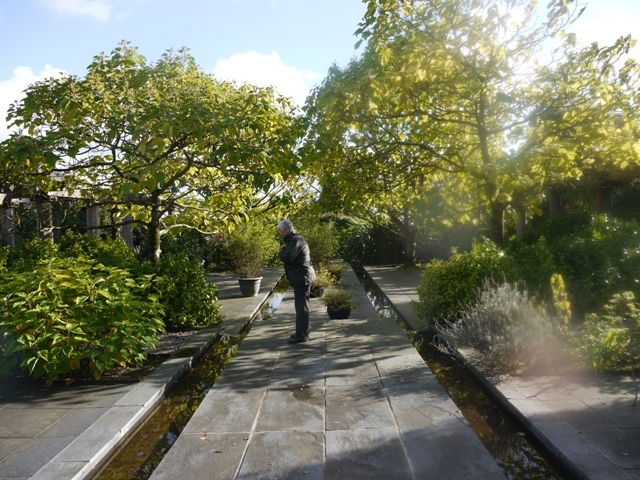 Martin Batty described how it reflects his enthusiasm for exotic and tender plants. His plantings in 2003 included tender South African Proteas, Leucodendron argenteum (the silver tree) , Mexican cactus and giant echiums. The first few years were encouraging, but many were lost in the severe winters of 2009 and 2010. The Echiums have come back from seed, and many other of his barely frost-hardy plants have flourished. 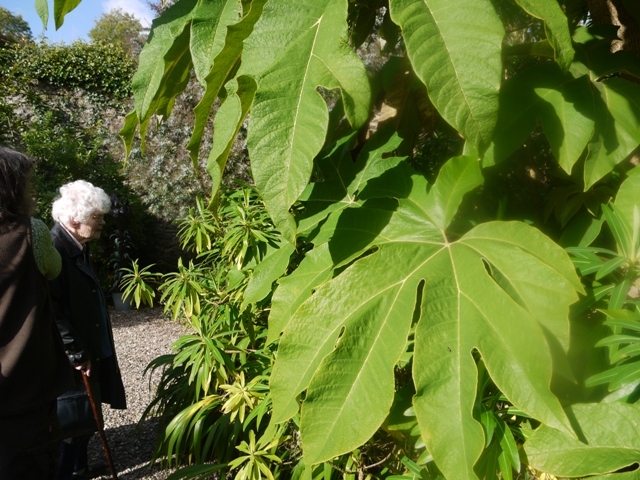 We saw many Southern hemisphere plants, Bailey’s Purple Wattle from Australia, which flowers here in February, the Rice paper plant Tetrapanax papyrifer, and the frothy foliage of Melianthus major. A curiousity was the weird saw-like leaves of Pseudopanax ferox. The lower leaves of this columnar plant are hard and rigid, higher up the plant they will grow soft and untoothed. Apparently this heterophylly evolved to protect the leaves from the attentions of the now extinct Moas of New Zealand. 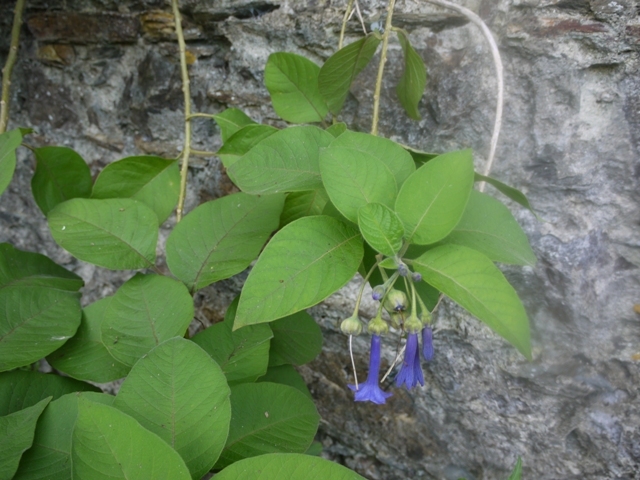 There were other unfamiliar plants: the blue dangling bells of Iochroma grandiflora from Peru, the floppy green fans of leaves of Iris confusa ‘ Martin Rix’ and a Muehlenbeckia (maidenhair vine) not scrabbling uncontrolled through native trees as we saw it on Herm Island two years ago, but disciplined into a neat tight green mound. There was even a Norfolk Island Pine, Araucaria heterophylla – more familiar in Canary Island and Florida tourist developments. I wonder how it will fare when it rears its head above the protective wall. The rest of the garden is less startling, with lawns and borders, a broad terrace on the south side of the house, and a nice array of low-growing foliage plants in a gravel garden outside the walled garden. However the Battys have enlivened these grounds with some interesting uses of wood. There is an inviting summerhouse, and what appear to be a pair of elaborate Palladian ashlar gateposts on the drive. 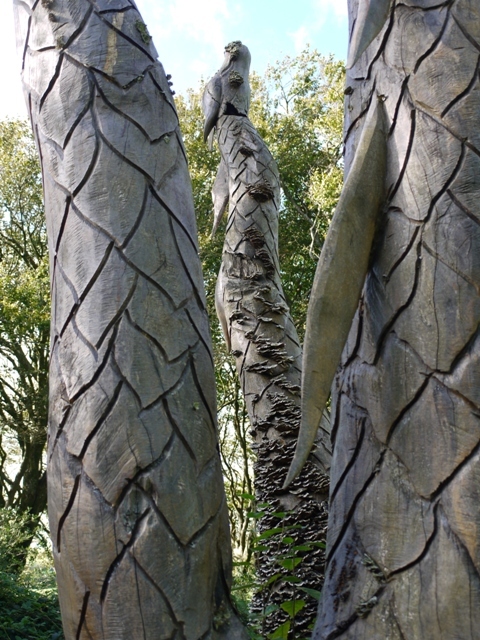 Closer inspection shows them to be carved of timber. 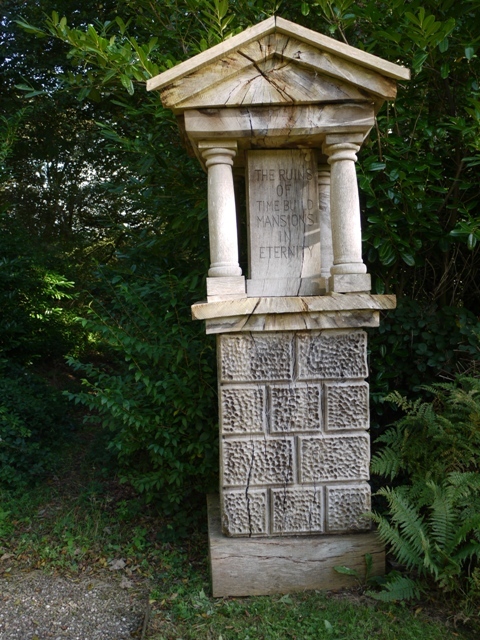 Panels are inscribed as mileposts: Doncaster 350 miles; Japan 4000 miles, which reflect the origins of the owners. Pausing between these posts one reads the enigmatic inscription THE RUINS OF TIME BUILD MANSIONS IN ETERNITY. 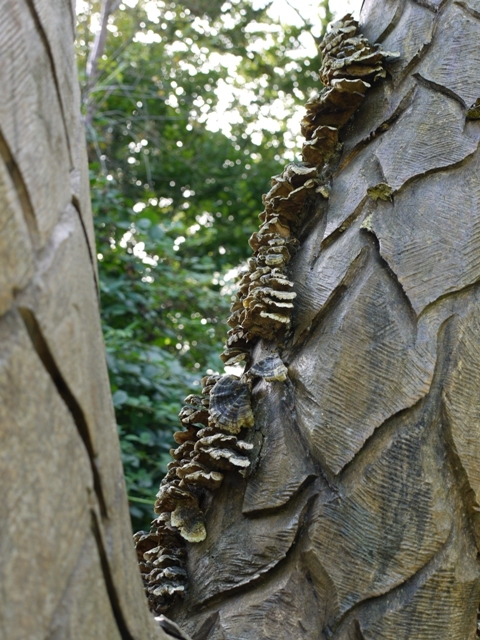 There is also a totem pole, a stack of four animals carved out of the trunk of a former beech tree and erected as a focal point west of the house. 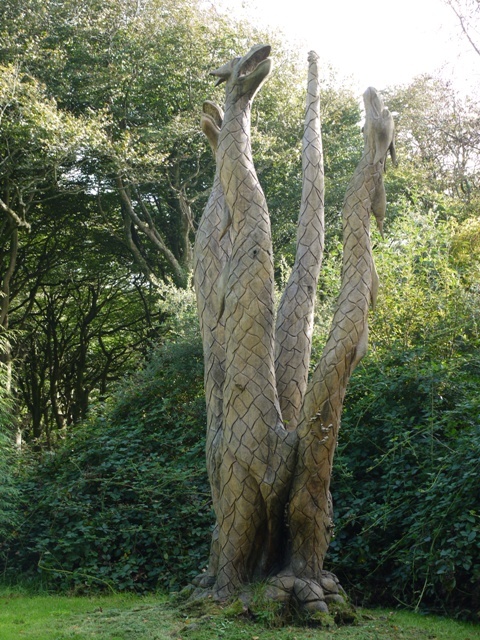 Another, multi-trunked dead beech has been carved in situ in the likeness of a four headed dragon. 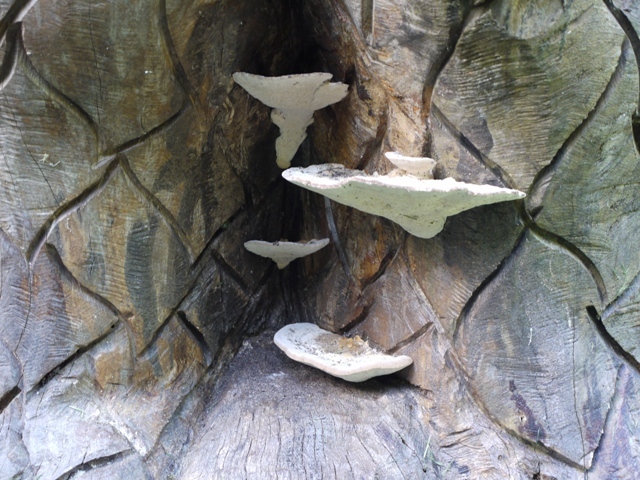 Here nature has embellished the chiselled scaly necks with bracket fungus and elegant frills of turkey tail fungus. This colonisation is also the harbinger of the sculpture’s destruction. But for a few years before the inevitable collapse, art and nature are most harmoniously combined. Gardeners go to so much trouble for such fleeting returns. Turkey tail. (Coriolus versicolor)is now properly known as Trametes vesicolor and apparently the source of a potent anti tumour drug. The garden is open on certain days under the National Garden Scheme. See the Yellow book and the free regional pamphlets which will soon appear.